I tried to find some statistics about average wages, but they are inconsistent. Figures released in 2015 show that women in Georgia earned an average salary of 697.3 GEL ($270), while a male earns 1,126.8 ($440). So, we can see that men earn substantially more there, regardless of business sector. The average pension is about $75. There is free health care, but nothing is really "free", and more favorable care can be arranged by getting private insurance costing from $10 - $50/month. With such poor wages, this seems almost impossible for most citizens. Georgians pay a flat tax on salaries and fees - 20%. If annual income exceeds 40,000 GEL ($15,600), the State will require additional taxes which are determined by the value of real estate owned by the family. At least, this is according to current information available here. Due to the fertile nature of Georgian soil, food is quite cheap - fresh fruits, vegetables and grains are all produced locally. With meat is another issue - sometimes expensive, and not the best quality, unless you like fatty dishes. What do you think? Could you live in such a village? This is something I continually ask myself... and the answer remains inconclusive. You're right, maybe village life in our countries is pretty the same. But the key difference is that Russia is an industrial country and Georgia is an agricultural country. They produce more than 50% of their GDP by poking in the soil. Russia gets here only 4.7%, and USA around 3%, I think. By the way, their GDP per capita is 2.5 times less than ours. That difference is bigger than the difference between the USA and Russia, for instance. It's very sad to read about how hard is life in Georgia. I hope it will improve sometimes, if Russia won't assault it again. Georgia was too long involved in common USSR economy and disconnection from other parts of USSR made a huge negative impact. They still can't find their niche in EU and world market and attract investments. o man. that is so mean and stupid. why would you lie here? Don't you know that international investigation concluded that the war was started by Georgia? your obesrvations are quite right. Life is very harsh there now. Poverty in Georgia and Armenia and less in Azerbajian (due to oil ) is omnipresent. It is an easy observation to make when you drive through the country. I think it is more stable, and definitely safer now compared to several decades ago, based on what my Georgian friends tell me. You could not even walk the streets of Tbilisi at night without caution, yet now the country is very safe. I walked around several cities alone, and felt no threat. I am not really sad about the economy of Georgia. Not every country has to be industrial. I just wish that they regain some political stability and can stop worrying about not so neighborly neighbors. If they build up the infrastructure to be a tourist paradise with high end agriculture, so be it. There is nothing wrong with it. As for low wages and gender income disparity, it is very indicative of an agrarian and rural society. Men will tend to have slight technological advantage (working with machinery), women being in charge of the household. I did not say they have to be industrial. :) They just need to produce something, not merely buy and sell. Tourism will continue to grow in the country, and it's how a lot of people there are making money. In fact, it seems women do most of the work in Georgia, even plowing in the fields, while men sit on the street and chat or play games. I saw it more than once...The Georgian who drove me around the country is trained as a lawyer, but has no work in this field, so he does tourism to pay the bills. I live in a big city and dreaming sometimes to escape into the rural place or suburb at least. But it seems for me that simple life is very hard, if you have no a lot of money. Me too...this is exactly why I went to Georgia. :) It would be good if I could still earn my American salary, but spend 3 - 6 mos. in Georgia, working remotely in some village. Internet coverage is excellent there, even in remote places. I was really shocked by this. :) Even in most mountain regions, I had no problem with connections. Haha! Yes, this is "roughing it" by American standards. :)) Has your daughter left the nest at last? Same with me. Good for temporary escape, but I'm not sure I'd be happy living in such an environment for years and years..unless my immediate family was also there with me. Very bright and picturesque snapshot! Georgia is such beautiful country although I was only in the pro Russian Ossetia. Could I live such a simple life? Why do you think that life in a village is a simple one? I think, it depends on who is living it. It is possible to have now in a village most of what the big cities could give and be very busy, entertained, more independent than a city resident but it requires a lot of specific knowledge which comes from father to son. I mean such activities as winery, honey production, growing or collecting of medical flowers. 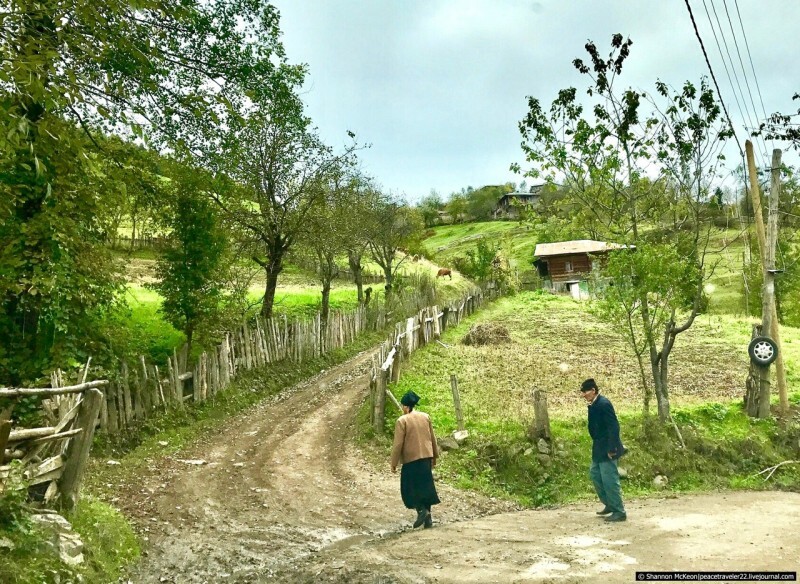 In Georgia, the villages have very scarce resources. I did not see any cinemas, or even decent markets where locals could shop. So, it just depends on the country really. I'll have short post about a village near Kazbegi later in the week. I absolutely do not think their life is simple - it's the wrong expression, so I removed it from the post. They are engaged in hard, physical labor, often living in harsh winter climates with lots of snow, etc. These mechanical and agricultural type skills are mostly gone in young boys now, in most countries, including the USA. There is great joy and pride in building something with your own hands, growing things, producing your own fruit, vegetables, milk, eggs on farms...but it is definitely not easy and requires a lot of time and resources. Could you please name three good qualities in Russian menatality? And three good qualities in Georgean mentality? (I mean something like "friendly," "goal-oriented"...) I want to understand better how you see Russians and Georgians. Of course, each person is different, even within the same country. But overall I think Russian people are really strong - they must be in order to survive decade after decade w/a lot of instability and uncertainty. The downside to this is that for some people they then grow bored with "normalcy". This happened to a few of my readers who worked and lived in the USA and didn't like it - returning to Russia. The main appeal of Georgian culture is that people are typically very friendly and open (similar to what I'm used to in the USA). You will feel it as soon as you arrive, or at least I did. You said Georgia is poor. Do you consider Russia a poor country too? I mean in general, big cities AND small villages. We can't compare life in big cities and small villages, regardless of the country. :) Opportunities are almost always lesser, and wages correspond in a lower amount too. If you look at statistical data, Georgia and Russia are both far behind the USA when it comes to average salaries, but compared to other places on the globe perhaps they are good - not sure, as I haven't researched wages in all nations. However, based on a quick look online, the average salaries in Russia and Georgia don't differ substantially. For instance look here, though I'm not sure how reliable the research is http://rbth.com/business/2016/05/20/the-average-salary-in-russia-is-now-lower-than-in-china-and-poland_594893. I think in near future more and more people will flee to rural area because a quality of food drop and price constantly grow. Environment of big cites are dangerous for health. The life with constant fuss and being sitting hours a day in a car is meaningless. Although the theaters, museums, institutes, specific hospitals are all in the big cities and I don't believe the Internet could solve totaly the problem of absents but e speed trains, planes and highways. One hundred years ago the rich Russians were living like this here - they had vast lands, plants, fabrics in rural areas and the mansions at capitals of different countries. Our vast lands need treatment and cultivation. I despise city life - that is why I now live far away in the suburbs, and the negative is that I sit in traffic for hours a day. However, I can work from home a few days a week, so it is manageable. I do not regret the decision to return to my hometown for a moment, even though it can hardly be called a "village." I think that people are either attracted to fast-paced city life, or not. I'm definitely in the latter category, but don't want to live w/absolutely no conveniences in life. I really want peace and quiet, and am not a social person by nature, preferring only the company of selected individuals rather than big crowds. You've missed the point. The majority of fruits and vegetables are imported from Turkey. Sorry Georgians, you know I'm right:( Why are you so proud of your middle-class standards of living? Nothing special at all. Some car, average home, mortgage, loans, boring job, traffic jams... Common, good engineer younger than you in Russia or Ukraine can have a nice apartment in property without any mortgage plus decent savings. Say nothing about our businessman or people working for the government... And don't say that 250 000$ per speech is not a corruption. You are right people are just people and life is pretty the same everywhere. Sure, you will be accustomed to life in that villages in a matter of months. And probably you would be a little bit happier. Excuse me? You know in what house I live, what car I drive, or how much I earn? I said I came from a middle-class family, but I'm now a lawyer at a big firm in Washington, DC making around 125k per year, thus I'm in the top 5% of earners in the USA. And so what? This doesn't change my view of the world, or the manner in which I live actually. I come from a humble background, and still live as such. This highly salary simply allows me the opportunity to travel more than I would if was making 40k, for instance. I thought for a moment, its a painting. Cool! :) Sometimes I get the same impression looking at the photo. Amazing what mobile phones can capture now.